Three runners at Sandown today on the Hillside course with Hang Man, Touch A Cloud and Za Za Gabor. Hang Man (pictured) has been made favourite to win race four, the Ladbrokes Back Yourself Handicap over 2400m. The import was a comfortable winner last start over 2200m at Bendigo and has progressed since then according to Mike Moroney. "He had his first start at a mile-and-a-half (2400m) in England and was beaten a nose at Ascot after finishing strongly and this is his first go at that trip for us,” Moroney said. 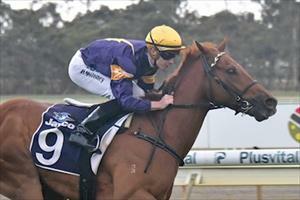 “He ran the 2200m out well last time at Bendigo and has trained on beautifully since. "He'll probably have two more starts in this sort of grade with the intention of getting his rating up and miss the spring, concentrating on the Autumn. “He does look a promising horse and I’d say he’ll be hard to beat all things being equal." Touch A Cloud and Za Za Gabor run in race three, the Mypunter 3YO Fillies Handicap over 1600m. Touch A Cloud has not raced since leading all the way to win her Maiden at Cranbourne on May 18. “We’re really happy with her and she’s trained on terrific since her last start win,” Moroney said. “She worked with Za Za Gabor the other morning and there was nothing between them. “I think she’s improved since her win and I’m not concerned if the forecast rain arrives and has an effect on the track. Za Za Gabor is having her first start in Australia and brings stakes form from New Zealand. “Although she’s a maiden she’s a very handy filly,” Moroney said. “She’s been running in the good fillies race in New Zealand and performed creditably. “Her last start she just missed in a Listed race over 2000m at Riccarton and a repeat of that effort would make her competitive here. Patrick Moloney will ride Touch A Cloud and Michael Dee is aboard Za Za Gabor.